Columbia, South Carolina, as posted here. S.719 is item #12 on the agenda. This is because in the last ( April 5 ) meeting of the Senate Judiciary Committee, S719 was item #13 on the Agenda, and the meeting stopped after finishing with two Statewide Appointments and agenda item #1. So that left S719 as 12 items further down on the agenda. So S.719 is 12th on the list for April 12th. It should be noted for the record that S.719 was introduced into the SC Senate over 11 months ago, on April 28, 2015, but that SC Senate Judiciary Committee Chairman Larry Martin ( R – Pickens ) refused to assign S.719 to a Senate Judiciary Subcommittee until March 16, 2016, over 10 months later. He did this as Senators co-sponsoring and/or pledged to support and vote for S.719 were being polled to support a Recall Motion on the floor of the Senate. In March 2016, with more than one dozen polled Senators already supporting a Recall Motion, S.719 personhood bill opponent Senate Judiciary Committee Chairman Larry Martin agreed to assign S.719, posted March 16, 2016. That three-man Judiciary Subcommittee ( Bright (ch), Corbin, M.B.Matthews ) met the next day, March 17, 2016, and favorably passed S.719 out of subcommittee to the full Senate Judiciary Committee. S.719 first appeared on the Senate Judiciary Committee Agenda for the March 22, 2016 meeting, where it appeared #24 out of 24 items. Although 19 agenda items were reached in the March 22 Meeting, as item #24, S.719 was not reached. The entire Senate was in Recess the following week, and no Senate Judiciary Committee meeting was held. S.719 next appeared on the Senate Judiciary Committee Agenda for the April 5, 2016 meeting, where it appeared as item #13. However, there were also two Statewide Appointments placed at the very beginning of the Agenda, and the second, contested appointment consumed most of the meeting, before the Judiciary Committee took up and voted upon only the first agenda item, before Senate Judiciary Committee Chairman Larry Martin called an end to the approx. two-hour meeting. Now S.719 is item #12 on the Agenda for the April 12, 2016 meeting. It remains to be seen whether or not the Senate Judiciary Committee chaired by ***Senator Larry Martin ( R – Pickens ) will actually reach S.719 on April 12, and if so, will S.719 receive an up or down vote on April 12, or will it be “carried over” to the next Senate Judiciary Committee meeting, likely April 19, 2016 ? One last point, under normal procedures, legislation from one chamber must be passed and sent to the other chamber by May 1 in any particular year for the legislation to be taken up on the floor of the receiving body. For example, S.719 Personhood Constitutional Amendment needs to be passed by the SC Senate and sent to the SC House by May 1, 2016 to be considered on the floor of the SC House in the 2016 Session. We are in the second year of the 2015-2016 Session. Any legislation that is not passed in 2016 is dead, and would need to be re-filed for the 2017-2018 Session. NOTE: This May 1st rule could be waived by a 2/3 vote of those present and voting in the House ( or vice versa if a bill ( e.g., H.4093 ) was being sent from the House to the Senate. in our own State Constitution ! [ SC Senators Larry A. Martin, Chairman, Brad Hutto, Gerald Malloy, Creighton B. Coleman, Karl B. Allen, Kevin L. Johnson, Marlon E. Kimpson, and Margie Bright Matthews ]. 1) S.719 SC Personhood Constitutional Amendment was #13 ( item “M.” ) on the Agenda for the Tuesday, April 5th, 3PM meeting of the Senate Judiciary Committee ( 13 R, 9 D ). 2) However, there were also two Statewide Appointment nominations for appointed positions which were scheduled for consideration by the Judiciary Committee and which were placed at the beginning of the meeting. 3) The meeting lasted just over two hours, however nearly all the time was taken up with the second of the two appointments, which was contested and took over 1 hour and 50 minutes. Then, in the last three minutes of the meeting, only the first item on the Agenda ( item “A.” ), was explained and voted upon before the Judiciary Committee meeting was ended by the Chairman, Senator Larry A. Martin ( R-Pickens ). the top of the agenda, both of which circumstances occurred on April 5th. 5) The meeting will likely be in Room 105 in the Senate Gressette Office Bldg., State House grounds, Columbia, South Carolina, however it is advised to check the meeting details as posted here. Notes: a) Rex Rice is reported to have pledged his support and vote for S.719 Personhood Constitutional Amendment. b) Don Joslyn is reported to be a Personhood legislation supporter also. Note: Evan Guthrie has said he would support and vote for S.719 Personhood Constitutional Amendment. Note: Mark Palmer has said he would supports S.719 Personhood Constitutional Amendment. 1) To please vote to pass S.719 SC Personhood Constitutional Amendment next Tuesday, April 12th in the Senate Judiciary Committee, to move forward the effort to put S.719 on the ballot in the November 8, 2016 General Election and let the people of South Carolina have the opportunity to vote on what is in our own State Constitution! If you are a Bible-believing, born again Christian, please pray for the Lord to turn the hearts of these seven ( 7 ) SC State Senators above, as well as each of the other eight ( 8 ) Senate members of the 22-man Senate Judiciary Committee ( 13 R, 9 D ) who are not signed on as co-sponsors, or who have not pledged to support S.719 [ SC Senators Larry A. Martin, Chairman, Brad Hutto, Gerald Malloy, Creighton B. Coleman, Karl B. Allen, Kevin L. Johnson, Marlon E. Kimpson, and Margie Bright Matthews ]. S.719 SC Personhood Constitutional Amendment is #13 ( item “M.” ) on the Senate Judiciary Committee (13 R, 9 D) Agenda for the April 5th, 3PM meeting in Room 308 in the Senate Gressette Office Bldg., State House grounds, Columbia, South Carolina, as posted here. S.719 is item #13 on the agenda. This is because in the last ( March 22 ) meeting of the Senate Judiciary Committee, S719 was item #24 out of 24 items on the Agenda, and the meeting stopped after finishing with item #19. So that left five items ( items #19 thru #24 ) which had not been taken up at all in the March 22 meeting. Then there were also seven bills in the March 22 Senate Judiciary Committee meeting which were taken up, but then were at some point “carried over”. So S.719 is 13th on the list for April 5th. For those who decide to come to the Judiciary Committee meeting on April 5th (public interest and accountability are important), it is recommended you arrive in the committee meeting room at 2:00 pm (especially with the slightly smaller audience seating size of Room 308 as compared to the usual Room 105). Pink lapel tags have been prepared that can be pinned on to identify S719 SC Personhood Constitutional Amendment supporters, and it is requested that S719 supporters please sit as close to the front rows as possible. [SC Senators Larry A. Martin, Chairman, Brad Hutto, Gerald Malloy, Creighton B. Coleman, Karl B. Allen, Kevin L. Johnson, Marlon E. Kimpson, and Margie Bright Matthews]. The SC Senate Judiciary Committee met for nearly three hours on Tuesday, March 22, however the meeting ended five items short ( after finishing item #19 ) before reaching the last item ( #24 out of 24 Agenda items ), S.719 SC Personhood Constitutional Amendment. With the SC Senate in Recess all of next week ( March 27 – April 2 ), the next regular Tuesday meeting of the full Senate Judiciary Committee will likely be Tuesday, April 5 at 3pm. It is expected that S.719 will be taken up at that meeting. At present, there are eight known votes in support of S.719 on the 22-man Senate Judiciary Committee. One of the non-supporting Senators has agreed to abstain, meaning we may need up to 11 votes for S.719 to pass on April 5. See the list posted here of the 22 Senators who are members of the Senate Judiciary Committee ( 13 R, 9 D ), and these Members’ Positions on the S.719 SC Personhood Constitutional Amendment. Please continue to contact / lobby non-supporting Senators. Contact information on the South Carolina Legislature website for all SC Senators is posted here. Please see the letter below regarding contacting / lobbying seven specific non-supporting Senators who are members of the Senate Judiciary Committee: Senators Campsen, Bennett, Hembree, Rankin, Thurmond, McElveen, and Saab. You may complete Senate Lobbying Memos and send them to Christians for Personhood, PO Box 12222, Columbia, SC 29211 by Monday April 4 ( NLT April 5 ), to be turned in at the State House for hand-delivery to each Senator personally in the Senate chamber. Two example Senate Lobbying Memos posted here. Two blank Senate Lobbying Memos posted here. Judiciary Committee, chaired by judicial supremacist Senator Larry Martin ( R-Pickens ), who opposes SC Personhood Constitutional Amendment S.719. S.719 appeared on the Agenda as #24 of 24 items. On Tuesday, March 22, the full Senate Judiciary Committee meeting started early, and met for nearly three hours, however the meeting ended five items short ( after finishing item #19 ) before reaching the last item, SC Personhood Constitutional Amendment S.719. With the SC Senate in Recess all of next week ( March 27- April 2 ), that means the next regular Tuesday meeting of the full Senate Judiciary Committee will likely be Tuesday, April 5 at 3pm. It is very likely S.719 will be taken up for consideration at that meeting. Please consider attending, arriving at 2pm if possible, sitting near the front, and obtaining a pink lapel tag to wear showing your support of S.719. The meeting will likely be in Room 105, Gressette Senate Office Bldg, immediately behind the SC State House. Please look at the two example lobbying memos which are posted here to Senator Campsen and to Senator Hembree. Using the four blank lobbying memos enclosed, please write up memos like these in your own handwriting, using your name, to at least four of these seven Senators: Campsen, Bennett, Hembree, Rankin, Thurmond, McElveen, and Saab. [ You may also print out more blank lobbying memos posted here [ two blank Senate Lobbying Memos ], or you can go to the “Personhood Act” page of the ChristianLifeandLiberty.net website. 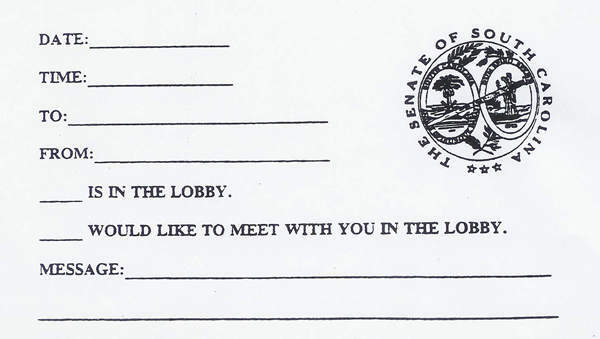 Go to the “Personhood Act” page, item # 102., which is entitled:“Blank Form – Memo Form for Lobbying SC Senate Members”. ] Write-up memos to all seven if you wish. IMPORTANT ! The Judiciary Committee meeting is likely at 3pm, however the entire Senate goes into Session inside the SC State House Tuesday, April 5 at 12 noon. Please mail your completed lobbying memos back to Christians for Personhood, PO Box 12222, Columbia, SC 29211, such that they arrive, preferably, on or before Monday, April 4, but absolutely NLT Tuesday, April 5 in the morning mail, so that they can be picked up, taken to the SC State House, and turned in to the courtesy desk located just outside the Senate chamber, for hand-delivery by Senate pages to each Senator personally inside the chamber during Session. If SC Personhood Constitutional Amendment S.719 is to pass the SC Senate, and if S.719 is to be placed on the November 8, 2016 General Election ballot for the people of South Carolina to vote on whether our State Constitution will explicitly protect the lives of pre-birth human beings from the moment of conception ( fertilization ), then S.719 must come out of the Senate Judiciary Committee. Please do what you can to help stop the shedding of innocent blood in South Carolina. Thank you.